Patrick Heron was born in Leeds and began creating designs for his father’s company Cresta Silks when still in his teens while also studying at the Slade School of Fine Art (1937-39). He was a conscientious objector during World War II, and worked as a farm labourer before moving to St Ives, Cornwall in the mid 1940s, where he worked in the Leach pottery studio and met such leading artists as Ben Nicholson and Barbara Hepworth. Heron wrote widely as an art critic and enjoyed international recognition in the art world. Influenced by Braque in the 1940s, Patrick Heron turned completely to abstract art, influenced by the American abstract expressionists and his move to Cornwall in 1956. This work is typical of his characteristic language, balancing colour and space. It is one of two by this artist purchased in 1967 for the brand new University Art Collection. He wrote “There is no shape that is not conveyed to you by colour, and there is no colour that can present itself to you without involving shape. If there is no shape then the colour would be right across your retina “. 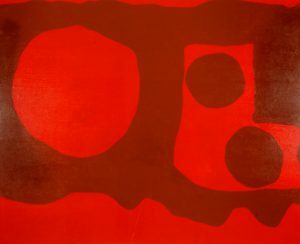 The Art Collection holds two works by Patrick Heron in the collection and Cadmium and Light Red will be on display in the Gallery in the University Pathfoot Building this autumn as part of our 1967 exhibition.